Russian-branded cars will soon regain their international roots with a debut in Western Europe following a painstaking modernization by partners Renault-Nissan. “My friend had one which I liked so much, I just had to have one of my own,” says Neil Chowney of Winchester in the U.K., illustrating the devotion Lada owners around the world have for their vehicles. That was seven years ago. Now Mr. Chowney has two Ladas - a 1.7-liter fuel injection Niva off-roader and a 1.5-liter Riva four-door saloon. And he really enjoys taking his Niva - also sold as the 4x4, Bognor Diva, Job, Taiga, Sport, Bushman and VAZ-2121 in various markets world-wide - off-road. “It may not be very fast but it’s very good off-road,” says Mr. Chowney. While Lada may be the best-known marque outside of the country, Russian car making stretches back to Tsarist times when vehicles based on German designs were hand-produced in Riga in modern-day Latvia. The first mass-produced autos, however, were licensed versions of Ford’s A-model made at the GAZ factory in Nizhny Novgorod in 1929. Over 40,000 GAZ-As and GAZ-AAs were made until World War II required that the plant switch entirely to military production of trucks and jeeps. After World War II, car production really took off powered by an economic boom and expansion of the middle class, with the Soviet government once again relying on Western technology to manufacture a car for the masses. The VAZ plant in Togliatti (named after Italian communist Palmiro Togliatti) was constructed in partnership with Italian car maker Fiat in 1966-70 and would come to produce what is now known as the “Classic” Lada - also marketed as the Signet, Nova and VAZ-2101, 2102, 2103, 2104, 2105, 2106 and 2107 - in the various countries in which it was sold. In 1967, the year of its launch, the “Classic” took the European Automobile of the Year award and by the time production stopped last year, some 20 million had been sold. For mainly domestic sale, GAZ also produced the Volga passenger car, the Chaika limousine (for the Communist Party elite) and the Moskvitch passenger car, manufactured in the cities of Izhevsk and Moscow when the Soviet Union acquired an entire Opel manufacturing line from Germany after World War II. By 1985 the Soviet Union was producing over two million vehicles (including 1.2 million passenger cars) annually, making it the fifth largest producer in the world. The fall of the Soviet Union and subsequent economic decline hit the country’s automobile industry hard: among passenger cars, only Togliatti-based Lada sedans and Ulyanovsk-based UAZ off-roaders and SUVs survived for any length of time. Falling import tariffs and rising consumer incomes in the 2000s further hurt local automobile producers as their primary competitive advantage, low price, was eroded with increasingly wealthy local consumers demanding a better product. Sales of new cars under Russian brand names dropped to 580,000 last year from a peak of 920,000 in 2002. 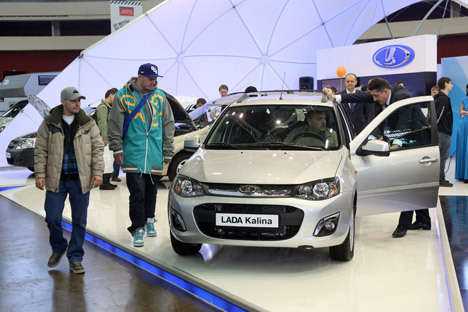 Lada still sells the top three most popular passenger models in the country, however: the Priora, Granta, and Kalina, according to the Association of European Businesses. To boost flagging prospects, local companies have again turned abroad for assistance, with alliances like Ford-Sollers and Renault-Nissan-VAZ. And this in turn, at the same time as offering foreign players improved access to the Russian market is providing the opportunity to revive exports of Russian-made vehicles. In March, Renault-Nissan-VAZ announced plans to export its new economy-class Lada Granta sedan to Germany, France, Serbia, Bulgaria and the Baltic countries. Andrei Beryukov, head of Yo-Avto, Russia’s first producer of hybrid cars scheduled to debut next year, believes that news of the modernization carried out by Renault-Nissan at the Lada plant has already revived foreign interest in Russian-made cars. Yo-Avto is also in negotiations to export the company’s first model in the coming years, he adds. It may no longer be being made but the enthusiasm for the “Classic” Lada shows no sign of diminishing. CA quick search of the Internet reveals clubs of like-minded enthusiasts across the globe . And they all still appear to be having a lot of fun.